For other uses, see Magdala (disambiguation). Magdala (Aramaic: מגדלא / Magdala, meaning "tower"; Hebrew: מגדל / Migdal; Arabic: المجدل / al-Majdal) was an ancient city on the shore of the Sea of Galilee, 3 miles (4.8 km) north of Tiberias. In the Babylonian Talmud it is known as Magdala Nunayya (Aramaic: מגדלא נוניה, meaning "Tower of the Fishes"), and which some historical geographers think may refer to Tarichaea, literally the place of processing fish. It is believed to be the birthplace of Mary Magdalene. 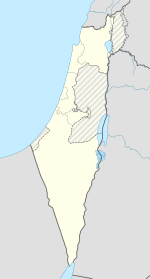 Until the 1948 Arab–Israeli War, a small Arab village, al-Majdal, stood at the site of ancient Magdala, while nowadays the modern Israeli municipality of Migdal extends to the area. Archaeological excavations on behalf of the Israel Antiquities Authority conducted in 2006 found that the settlement began during the Hellenistic period (between the 2nd and 1st centuries BCE) and ended during the late Roman period (3rd century CE). Later excavations in 2009–2013 brought perhaps the most important discovery in the site: an ancient synagogue, called the "Migdal Synagogue". It is the oldest synagogue found in the Galilee, and one of the only synagogues from that period found in the entire country, as of the time of the excavation. They also found the Magdala stone, which has a seven-branched menorah symbol carved on it. 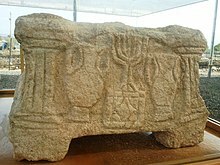 It is the earliest menorah of that period to be discovered outside of Jerusalem. Gustaf Dalman writes of Magdala that, "it was the most important city on the western bank of the lake, contributing a wagon-load of taxes [...] until Herod Antipas raised up a rival on the lake by building Tiberias." Magdala is also described as "the capital of a toparchy", and is compared to Sepphoris and Tiberias in that it had "administrative apparatus and personnel," though not to the same extent. The remains of a Roman-period synagogue dated to between 50 BCE and 100 CE were discovered in 2009. The walls of the 120-square-metre (1,300 sq ft) main hall were decorated with brightly colored frescoes, and there was a stone carved with a seven-branched menorah. Recognition of Magdala as the birthplace of Mary Magdalene appears in texts dating back to the 6th century CE. In the 8th and 10th centuries CE, Christian sources write of a church in the village that was also Mary Magdalene's house, where Jesus is said to have exorcised her of demons. The anonymously penned Life of Constantine attributes the building of the church to Saint Helena of Constantinople in the 4th century CE, at the location where she found Mary Magdalene's house. Christian pilgrims to Palestine in the 12th century mention the location of Magdala, but fail to mention the presence of any church. Under the rule of the Mamluks in the 13th century, sources indicate that the church was not destroyed, but was transformed into a stable. In 1283, Burchard of Mount Sion records having entered the house of Mary Magdalene in the village, and about ten years later, Ricoldus of Montecroce noted his joy at having found the church and house still standing. All four gospels refer to a follower of Jesus called Mary Magdalene, and it is usually assumed  that this means "Mary from Magdala". There is no biblical information to indicate whether this was her home or her birthplace. Most Christian scholars assume that she was from Magdala Nunayya, and that this is also where Jesus landed on the occasion recorded by Matthew. The New Testament makes one disputable mention of a place called Magdala. Matthew 15:39 of the King James' Version (KJV) reads, "And he [Ha Yeshua] sent away the multitude, and took ship, and came into the coasts of Magdala". However, some Greek manuscripts give the name of the place as "Magadan", and more recent translations (such as the Revised Version) follow this. Although some commentators state confidently that the two refer to the same place, others dismiss the substitution of Magdala for Magadan as simply "to substitute a known for an unknown place". The parallel passage in Mark's gospel[8:10] gives (in the majority of manuscripts) a quite different place name, Dalmanutha, although a handful of manuscripts give either Magdala or Magadan presumably by assimilation to the Matthean text—believed in ancient times to be older than that of Mark, though this opinion has now been reversed. The Jewish Talmud distinguishes between two Magdalas only. Magdala Gadar—One Magdala was in the east, on the River Yarmouk near Gadara (in the Middle Ages "Jadar", now Umm Qais), thus acquiring the name Magdala Gadar. Magdala Nunayya—There was another, better-known Magdala near Tiberias, Magdala Nunayya ("Magdala of the fishes"), which would locate it on the shore of the Sea of Galilee. Al-Majdal, a Palestinian Arab village depopulated in the lead up to the 1948 Arab-Israeli war was identified as the site of this Magdala. The modern Israeli municipality of Migdal, founded in 1910 and about 6 km NNW of Tiberias, has expanded into the area of the former village. Some researchers think that Josephus refers to Magdala Nunayya by the Greek name Tarichaea, derived from the Greek Τάριχος or tarichos, meaning 'fish preserved by salting or drying', although the matter remains disputed. Magdala's reference in Matthew 15: 39 is, in some editions, given as "Magadan" ; and in Mark 8: 10 it is "Dalmanutha" . Excavations at Magdala during 2007-8 were called The Magdala Project. ^ Avshalom-Gorni, Dina (11 November 2009). "Volume 121 Year 2009: Migdal". Hadashot Arkheologiyot. ^ Avshalom-Gorni, Dina; Najar, Arfan (6 August 2013). "Volume 125 Year 2013: Migdal". Hadashot Arkheologiyot. ^ Schaberg, 2004, pp. 56–57. ^ a b Merk, August. "Magdala." The Catholic Encyclopedia. Vol. 9. New York: Robert Appleton Company, 1910, 31 Oct. 2009 <http://www.newadvent.org/cathen/09523a.htm>. 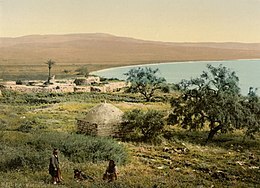 ^ The location of Tarichaea: north or south of Tiberias? ^ Gardner, Laurence (2005). The Magdalene legacy. London: Element (Harper Collins). ISBN 0 00 720186 9. ^ Bussolin, Alfonso. "MagdalaProject.org". Studium Biblicum Franciscanum - Faculty of Biblical Sciences and Archaeology. Retrieved 3 March 2014. ^ Lena, Anna (2013-12-31). "Magdala 2008; Preliminary Report". ESI (is Israel's oldest scientific journal). 2008. 125. Retrieved 3 March 2014. Achtermeier, P. J. (Ed.) (1996). The Harper Collins Bible Dictionary. San Francisco: Harper Collins. Horton, R. F. (1907). A devotional commentary on St. Matthew. London: National Council of the Evangelical Free Churches. Jones, I. H. (1994). St Matthew. London: Epworth Press. Throckmorton, B. H. (1992). Gospel parallels, 5th edn. Nashville TN: Thomas Nelson. Wikimedia Commons has media related to Magdala, Israel.